NO PURCHASE NECESSARY TO ENTER OR WIN. ALL FEDERAL, STATE, LOCAL AND MUNICIPAL LAWS, AND REGULATIONS APPLY. VOID WHERE PROHIBITED OR RESTRICTED BY LAW. ELIGIBILITY: This Contest is offered only to legal residents of the United States 18 years old or older at the time of entry. One winner per household. One winner per family. Prizes are non-transferable. Winners of a contest or sweepstakes hosted or sponsored by Sponsor (as defined below) or its/their affiliates within the past 90 days are not eligible. Sponsor and their respective affiliates, subsidiaries, parents, advertising and promotional agencies, and other companies associated with the Contest, and each of their officers, directors, shareholders, representatives, employees, interns, partners and agents (the foregoing collectively, “Contest Parties”) and members of Contest Parties’ immediate families and members of the same households of such individuals, are not eligible. The term “immediate families” includes spouses, grandparents, parents, siblings, children, and grandchildren. No groups, clubs, or organizations may participate in this Contest or reproduce or distribute any portion of these Official Rules to their members. Proof of age, identity, and eligibility must be furnished to Sponsor upon request. All entry form information must be complete and accurate. Sponsor will not award a prize to anyone not meeting eligibility requirements at the time of entry. By entering, you agree to comply with all applicable law and these Official Rules, and you agree to abide by all decisions of Sponsor. Sponsor reserves the right to disqualify any entrant if these Official Rules are not followed. Internet access is necessary to enter. DEADLINES: The Contest entry period begins at 6:00 PM local time on March 22, 2019, and ends at 9:00 AM local time on March 27, 2019 (“Entry Period”). The sole determinant of time for purposes of entries will be Sponsor’s server machine located in the EASTERN time zone. HOW TO ENTER: Eligible entrants may enter the Contest by visiting https://gvc.typeform.com/to/uB2dH5 and completing the entry form. 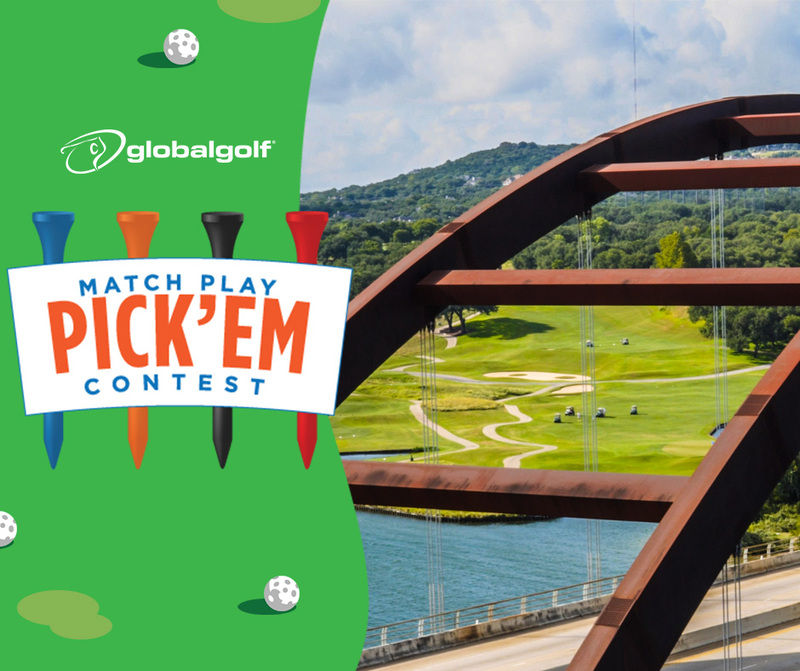 Contestants choose who will finish first, second, third, and fourth in the WGC – Dell Technologies Match Play tournament. Each place is assigned a set amount of points. Points for each entry will be added and winners of the prizes will be determined by that total. If there is a tie, the tie-breaker is the number of putts by the tournament champion in the final match. If no clear winner is chosen for each prize, entries will be chosen at random to win the prize. All complete eligible entries will be entered in the Contest. One entry per person AND/OR email address. Duplicate entries will be disqualified. All entries must be received during the Entry Period. Sponsor will not verify receipt of entries. Incomplete entries are void. Sponsor is not responsible for entries that are lost, late, misdirected, incomplete, incomprehensible, illegible, damaged, undeliverable or delayed. Entries generated by any automated means are void. Entries will be deemed to have been submitted by the authorized account holder of the email address submitted at the time of the online entry or trade-in. “Authorized account holder” is defined as the natural person who is assigned to an email address by an Internet access provider, online service provider, or other organization (e.g., business, educational institution, etc.) that is responsible for assigning email addresses for the domain associated with the submitted email address. Entries become the property of Sponsor and will not be returned. Entrants must have a valid email address and it is entrant’s responsibility to update Sponsor of any change in email address. Potential winner(s) may be requested to provide Sponsor with proof that the potential winner(s) is the authorized account holder of the email address associated with the winning entry. ODDS: Odds of winning depend upon the number of eligible entries received during the Entry Period. All charges, fees, and costs not specifically included in the prize description above, including but not limited to personal incidental items, transportation, airfare, accommodations, taxes, surcharges, souvenirs, gratuities, and licenses, are the responsibility of the respective winner(s) and, if applicable, their guests. Winner(s) responsible for all applicable federal, state, and local income taxes. An IRS Form 1099 will be issued for all prizes with an approximate retail value in excess of $600. Prizes are non-transferable and may not be redeemed for cash. No prize substitution allowed by winner(s). Sponsor reserves the right to substitute a prize of equal or greater value for any reason in the sole discretion of Sponsor if the prize or any component thereof is unavailable for any reason. HOW TO WIN: Winners will be selected from a pool of all online eligible entrants. The point totals will be tabulated after 3/31/2019. In the event of a random drawing, the drawing will be conducted on or about April 1, 2019 – April 3, 2019. Point tabulating and random drawings will be held at the Global Value Commerce, Inc. offices in Raleigh, NC. Global Value Commerce, Inc. or GlobalGolf.com decisions shall be final. Potential winner(s) will be notified by email within two (2) days of selection. Winner must respond to such notification, by contacting the Contest coordinator provided in the notification, within seven (7) business days after the notification is sent by Sponsor, or the Winner will be subject to disqualification, in which case the prize will be forfeited, and an alternate Winner will be randomly selected from among the remaining eligible entries, time permitting. Following confirmation of winners, prizes will be shipped to winners at the physical address provided in their entry. Sponsor is not responsible for incomplete, incomprehensible, illegible, or out-of-service contact information. In order to be named a winner, potential winner(s) may be required to sign and return an Affidavit of Eligibility/Prize Acceptance Form/Liability Release and/or where legally permissible a Publicity Release upon accepting a prize. Winner’s guest(s), if applicable, may also be required to sign and return a Liability and Publicity Release prior to the winner’s receipt of prize. Failure to sign and return such required forms by the winner (and, if applicable, winner’s guest(s)) may result in disqualification and selection of an alternate winner. USE OF CONTEST INFORMATION; PUBLICITY RELEASE: Notwithstanding any contrary provision in any of Contest Parties’ respective privacy policies, entrants grant to Contest Parties, and Sweepstakes Parties reserve, the right to use any and all information related to the Contest, including information provided by entrants in connection with the Contest, for marketing purposes or any other purpose, unless prohibited by law. Global Value Commerce, Inc. or GlobalGolf.com may use information which all entrants provide about themselves to send them announcements about Global Value Commerce, Inc. or GlobalGolf.com products and programs via electronic and ordinary mail. Except where prohibited, entry in the Contest constitutes each entrant’s consent to use, publish, reproduce for all purposes, including publicity, promotion and advertising, in any media (including but not limited to the Internet, television, radio, and mobile promotions) in perpetuity without further compensation, credit or right of review or approval. As stated above, winner(s) may be required to sign a Publicity Release that grants permission to Contest Parties to use his or her name, photograph, likeness, voice, prize information and/or biographical information for all purposes, including publicity, promotion and advertising, in any media (including but not limited to the Internet, television, radio, and mobile promotions) in perpetuity without further compensation, credit or right of review or approval, unless prohibited by law. CONDUCT; NO INTERFERENCE WITH OPERATION OF CONTEST: By entering the Contest, you agree to be bound by these Official Rules. The Official Rules are posted at [http://blog.globalgolf.com/match-play-pick-em-contest-official-rules/] throughout the Contest. You further agree to be bound by the decisions of the Sponsor, which shall be final and binding in all respects. You are responsible for complying with all applicable federal, state, and local laws and regulations and with these Official Rules, and by entering, you agree to be bound to these Official Rules. You further agree to not knowingly damage or cause interruption of the Contest or to prevent others’ participation in the Contest. CAUTION: ANY ATTEMPT BY A PARTICIPANT OR ANY OTHER INDIVIDUAL TO TAMPER WITH OR DAMAGE WEB SITES ASSOCIATED WITH THE CONTEST OR TO UNDERMINE THE LEGITIMATE OPERATION OF THE CONTEST MAY BE A VIOLATION OF CRIMINAL AND CIVIL LAWS, AND SHOULD SUCH AN ATTEMPT BE MADE, SPONSOR RESERVES THE RIGHT TO SEEK DAMAGES (INCLUDING ATTORNEYS’ FEES) AND ANY OTHER REMEDIES FROM ANY SUCH PERSON TO THE FULLEST EXTENT PERMITTED BY LAW. Further, any such activity will disqualify the entrant and may result in the discontinuation, suspension, or cancellation of the Contest. GENERAL CONDITIONS; DISCLAIMER OF WARRANTY: If for any reason, the Contest is not capable of running as planned for any reason, including but not limited to infection by computer virus, bugs, tampering, and unauthorized intervention, fraud, technical failures, acts of God, war, terrorism, government regulation, disaster, fire, strikes, civil disorder, or any other causes beyond the control of Sponsor which corrupt or affect the administration, security, fairness, integrity of the Contest, Sponsor reserves the right in its discretion to disqualify any individual it believes has tampered with the entry process, and/or cancel, terminate, modify or suspend the Contest. Sponsor reserves the right to select winner(s) from eligible entries received as of the termination date. Sponsor may prohibit an entrant from participating in the Contest if it determines that said entrant is attempting to undermine the legitimate operation of the Contest by cheating, hacking, deception or other unfair playing practices or intending to abuse, threaten or harass other entrants. The Contest Parties (i) assume no responsibility for any error, omission, interruption, deletion, defect, delay in operation or transmission, communications line failure, theft or destruction or unauthorized access to, or alteration of, entries; (ii) are not responsible for any problems or technical malfunction of any telephone network or lines, wifi networks, computer online systems, servers, or provider, computer equipment, software, failure of any entry information to be received by Sponsor due to technical problems, human error or traffic congestion on the Internet or wifi networks or at any website; or (iii) any combination thereof, including any injury or damage to the participant’s or any other person’s computer related to or resulting from participation or downloading any materials in this Contest. SPONSOR MAKES NO WARRANTY, GUARANTEE, OR REPRESENTATION OF ANY KIND CONCERNING ANY PRIZE, AND SPONSOR SPECIFICALLY DISCLAIMS ANY IMPLIED WARRANTY OF MERCHANTABILITY, WARRANTY OF FITNESS, AND ANY OTHER IMPLIED WARRANTY. INTELLECTUAL PROPERTY: The Contest and all of the related website pages, contents and code are copyright of the applicable Contest Party or of the identified company. The names, logos, trademarks, services marks and icons identifying the products and services (“Marks”) of Contest Parties or the identified company are proprietary Marks of the applicable owner. Copying or unauthorized use of any copyrighted material or Marks without the express written consent of its owner is strictly prohibited. LIMITATION OF LIABILITY: WINNER(S) AND ENTRANTS AGREE, EXCEPT WHERE PROHIBITED BY LAW, TO RELEASE AND DISCHARGE, HOLD HARMLESS AND INDEMNIFY THE CONTEST PARTIES, AND ALL OTHERS ASSOCIATED WITH THE DEVELOPMENT AND EXECUTION OF THIS CONTEST, FROM ANY AND ALL TAX LIABILITY THAT MAY BE IMPOSED OR ASSOCIATED WITH RECEIPT OR USE OF THE PRIZE, AND FROM AND AGAINST ANY AND ALL CLAIMS, ACTIONS, PROCEEDINGS, AND LIABILITY FOR ANY DAMAGES, EXPENSES, FEES, INJURY OR LOSSES SUSTAINED IN CONNECTION WITH THE RECEIPT, OWNERSHIP, OR USE OF THE PRIZE OR WHILE TRAVELING TO, PREPARING FOR, OR PARTICIPATING IN ANY PRIZE-RELATED ACTIVITY INCLUDING, BUT NOT LIMITED TO, (A) PERSONAL INJURY OR DEATH, (B) TECHNICAL, NETWORK, ELECTRONIC, WIFI, COMPUTER, INTERNET, OR COMMUNICATIONS ERRORS, (C) UNAUTHORIZED HUMAN INTERVENTION IN THE CONTEST, (D) MECHANICAL, PRINTING, OR TYPOGRAPHICAL ERRORS, AND (E) ANY OTHER ERRORS OR PROBLEMS IN CONNECTION WITH THE CONTEST, INCLUDING, BUT NOT LIMITED TO, ERRORS IN ADMINISTRATION OF THE CONTEST, ANNOUNCEMENT OF THE WINNER(S), CANCELLATION OR POSTPONEMENT AND ANY CONTEST-RELATED MATERIALS. ENTRANT FURTHER AGREES THAT IN ANY CAUSE OF ACTION, THE CONTEST PARTIES’ LIABILITY WILL BE LIMITED TO THE COST OF ENTERING AND PARTICIPATING IN THE CONTEST, AND IN NO EVENT SHALL THE ENTRANT BE ENTITLED TO RECEIVE ATTORNEYS’ FEES. ENTRANT WAIVES THE RIGHT TO CLAIM ANY DAMAGES WHATSOEVER, INCLUDING, BUT NOT LIMITED TO, PUNITIVE, CONSEQUENTIAL, DIRECT, OR INDIRECT DAMAGES. For prizes valued at $600 or greater, the winner must provide his or her Social Security Number for tax purposes. Prize may be considered income, and any and all taxes associated with the prize are the responsibility of the winner. CHOICE OF LAW: Except where prohibited, each entrant agrees that any and all disputes, claims and causes of action arising out of, or connected with, the Contest or any prize awarded shall be resolved individually, without resort to any form of class action, and exclusively by the appropriate court located in Raleigh, North Carolina. All issues and questions concerning the construction, validity, interpretation and enforceability of these Official Rules, entrants rights and obligations, or the rights and obligations of the Sponsor in connection with the Contest, shall be governed by, and construed in accordance with, the laws of the North Carolina, without giving effect to any choice of law or conflict of law rules, which would cause the application of the laws of any jurisdiction other than North Carolina. SPONSOR: Global Value Commerce, Inc. and/or GlobalGolf.com, 7249 ACC Boulevard, Suite 107, Raleigh, NC 27617(“Sponsor”). OFFICIAL RULES AND WINNER LIST: These Official Rules and the name of the winner(s) may be obtained by sending a self-addressed, stamped #10 envelope to Sponsor with the Contest name (see the top of these Official Rules) on the outside of the envelope. Limit one (1) request per envelope. Requests must be sent within 60 days of winner(s) selection. These Official Rules supersede all other published editions. Sponsor reserves the right to change, alter, or amend these Official Rules as necessary, in its sole discretion, to ensure the fair administration of the Contest or to comply with applicable law. Failure by the Sponsor to enforce any provision of these Official Rules shall not constitute a waiver of that provision.